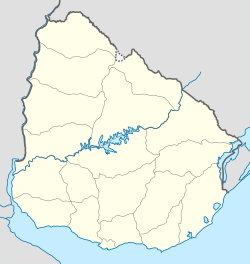 Salto (Spanish pronunciation: [ˈsalto]) is the capital city of the Salto Department in northwestern Uruguay. As of the 2011 census it had a population of 104,028 and is the second most populated city in Uruguay. Monument to José Gervasio Artigas, by Edmundo Prati, at Plaza Artigas in downtown Salto. During the late 2010's, Salto city saw a spate in criminal activity similar to those of other border cities across Latin America like Ciudad Juarez, Mexico, with drug trafficking and femicides among the principal crimes committed. According to Nicolas SantAnna, the president of the local commerce and industry syndicate, Salto's Don Atilio has become Uruguay's most dangerous barrio. Salto seen from the harbor. Salto is connected to Montevideo by regular bus services and by the railroad track Montevideo - Salto - Artigas. The main railway station is the Salto railway station (Estacion Salto). Nueva Hesperides International Airport had scheduled connections with Montevideo until 2015, enabling easy access to the local thermal baths. There are plans to improve it and local business people are keen to see it expand, allowing freight (particularly fruit) to be shipped directly from the region. Professional footballers Luis Suárez (FC Barcelona), Edinson Cavani (Paris Saint-Germain F.C.) and Bruno Fornaroli (Melbourne City) were born in Salto in 1987. The former two were members of the Uruguay squad that achieved a fourth-place finish at the 2010 FIFA World Cup, while the latter achieved the Golden Boot in the 2015–16 A-League season. ^ a b "Census 2011: Resultados Finales". INE. Retrieved 25 August 2012. ^ Bao, Sandra; Clark, Gregor; Symington, Andy; Bridget Gleeson; Lucas Vidgen (1 August 2010). Argentina. Lonely Planet. pp. 568–. ISBN 978-1-74179-464-9. Retrieved 22 December 2011. ^ a b c d e Marley, David (February 2008). Wars of the Americas: a chronology of armed conflict in the Western Hemisphere, 1492 to the present. ABC-CLIO. p. 447. ISBN 978-1-59884-100-8. Retrieved 22 December 2011. Cite error: Invalid <ref> tag; name "Marley2008" defined multiple times with different content (see the help page). ^ Articas and the Emancipation of Uruguay. CUP Archive. p. 150. GGKEY:G34D9993112. Retrieved 22 December 2011. ^ a b c "José Artigas Monument". New York City Government Parks. Retrieved 22 December 2011. ^ a b c "Statistics of urban localities (1834–2004)" (PDF). INE. 2012. Retrieved 5 September 2012. ^ ElPais. "Salto, la ciudad golpeada". ^ "Censos 2011 Cuadros Salto". INE. 2012. Archived from the original on 20 November 2012. Retrieved 25 August 2012. ^ "Estadísticas climatológicas" (in Spanish). Dirección Nacional de Meteorología. Archived from the original on November 30, 2014. Retrieved September 28, 2016. ^ "RECORDS METEOROLOGICOS EN EL URUGUAY" (in Spanish). Dirección Nacional de Meteorología. Retrieved April 30, 2014. ^ Sennott, Stephen (2004). Encyclopedia of twentieth century architecture. Taylor & Francis. pp. 363–. ISBN 978-1-57958-433-7. Retrieved 22 December 2011. ^ Behar, Lisa Block de (1995). A rhetoric of silence and other selected writings. Walter de Gruyter. p. 302. ISBN 978-3-11-014425-3. Retrieved 22 December 2011. ^ Koebel, William Henry (1911). Uruguay (Public domain ed.). C. Scribner's Sons. pp. 234, 235–. Retrieved 22 December 2011. ^ a b Maps (Map). Google Maps. Wikimedia Commons has media related to Salto, Uruguay. "Salto" . Encyclopædia Britannica (11th ed.). 1911.